If you follow Emily Bites on Facebook, you probably know that this past weekend my wonderful parents bought me the ice cream maker I’ve been wanting forever (this Cuisinart one) at Kohl’s with their 30% off coupon – thanks Mom & Dad! 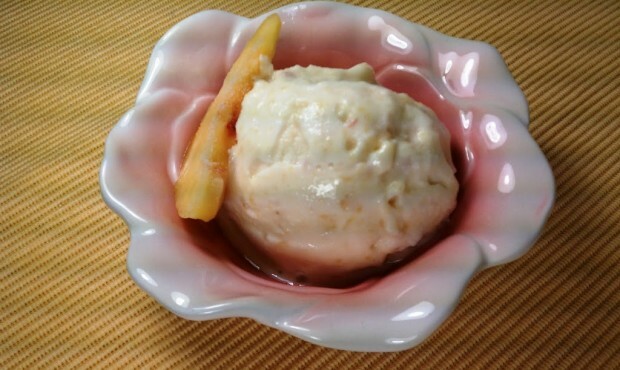 I’ve been collecting ice cream recipes for a while now in anticipation of making this purchase (it has been in my Amazon cart for about a month), so I was very excited to finally get to try out this Peach Ice Cream. I decided to start with one of the simplest recipes I’d found since it was my first attempt and it really could have been easier (except that I did kind of skim through the ice cream maker instructions in my excitement and ended up adding the ingredients before turning the machine on rather than the other way around. I had to scoop everything out and re-start it. Oops!). 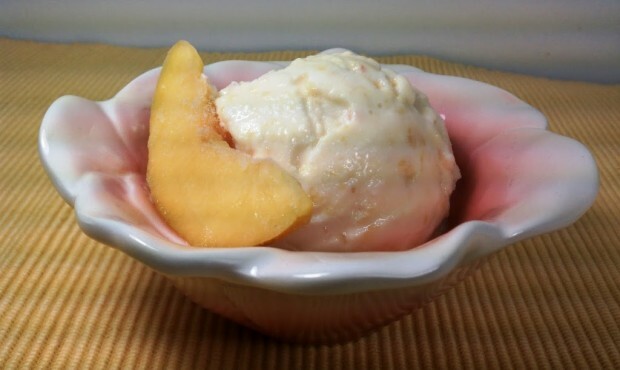 The peach ice cream turned out delicious. Simple, peachy, creamy, refreshing and it’s nice to know you’re eating something with only five ingredients, all pronounceable. I can’t wait to try more flavors! Place the peach slices in a food processor (a blender would work fine as well) and run until finely chopped. Put the peaches, half and half, sugar, milk and vanilla in a large bowl and stir to combine. Put the entire mixture into an ice cream freezer/maker and freeze according to manufacturer’s instructions. If the ice cream has not yet reached your desired consistency, transfer it to a sealed container and put in the freezer until fully frozen. Mine did not need additional freezing, but all ice cream freezers are different. Freeze any leftovers. How many quarts does this make? I’m super excited to try this out! It makes 4 cups, so 1 quart. Hope you like it! omg I’m so excited to try this!! I have the same ice cream maker and I’m looking forward to making a recipe that isn’t full of half and half and cream! PLUS I just got peaches at the market. yay! Oh, but how many peaches make 3 cups? Alright well I made this!! I had 4 ripe peaches and used another half a nectarine to get me to about 3 cups. I just finely chopped it by hand, though. Then I used an immersion blender when I mixed it with the liquid. Mine came out so much more orange though! But it was really quite tasty. Thank you so much for this easy recipe with so few and simple ingredients. yay for ice cream makers!! I made with 1/4 c sugar and 1/4 c Splenda equivalent. It brought the points on the WW recipe builder to 2 pts per 1/2 c serving. Super yum! Can this be made with other fruit? Not a huge peach fan?